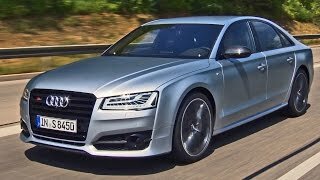 Audi is facing good competition from Mercedes and BMW for their Audi S8. It looks like to keep its ‘favorite full-size sedan’ image in front of buyers they came up with the Audi S8 plus 2016. The model basically went through entire overhaul and gains some commendable features and delivers remarkable performance figures. 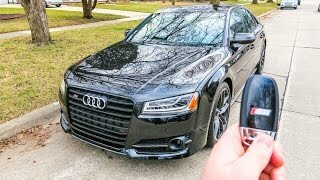 Let us have a look at the review of Audi S8 plus 2016 to know in detail about it. The interior of Audi S8 plus 2016 keeps the ‘plus’ tag and features a much sportive and luxurious body. The first thing after entering you might notice is the entire black leather drenched interior with contrast stitching and piping in Aras Red while the Alcantara makes its nest over the headliner. There is the ‘almost same’ three-spoke steering wheel hiding the standard instrument cluster that has white pointer inside the gray dials while the dashboard is dipped well in the essence of aluminum and carbon-fiber inserts. The center console gets the Black Piano Trim while there is a touchscreen mounted over the dash featuring command over infotainment and entertainment segment. Complementing the entire setup is the ambient lighting while the sensor-driven luggage compartment locking is another addon. In all the interior details of Audi S8 plus 2016 are remarkable and has everything that can rule your heart. regular goer with decent and clean looks. 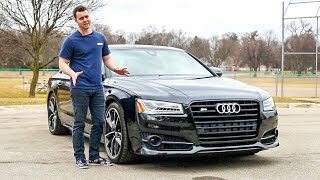 Powering the Audi S8 plus 2016 is a 4.0 liter TFSI V8 biturbo engine generating total output of 605 hp and peak torque of 700 nm mating to eight-speed Tiptronic transmission and Audi’s Quattro all-wheel-drive system. 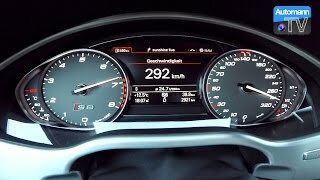 With this power rolling the model, the top speed of Audi S8 plus 2016 touches the mark of 155 mph while the 0-62 mph sprint can be knocked in just 3.8 seconds.